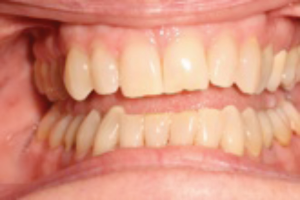 Case of chronic fatigue with dental signs of sleep breathing disorder: matching edges of upper and lower front teeth indicating teeth grinding. 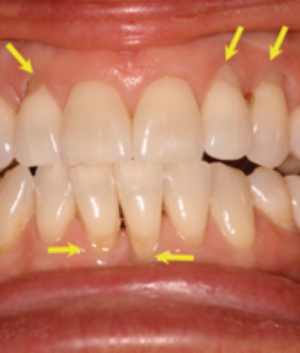 The arrows point to sensitive exposures called “abfractions.” Note the gum recession in the lower front of tooth. Teeth grinding is costly to both your teeth and health. Teeth grinding is part of sleep-breathing disorder that includes snoring and sleep apnea which in turn can lead to premature aging, and sudden death. Teeth grinding destroys natural teeth and dental work. Some of its signs are sore jaws in the morning, chipped or sawed-off front teeth, sensitive root exposures at gum lines, gum recession, sore jaw muscle and feeling tired on waking up from sleep. Why does the body hurt itself? The answer turns out to be survival. Teeth grinding is an attempt by the body to open up your airway for more oxygen during sleep. Grinding on the front teeth brings lower jaw forward and the tongue away from the throat, exactly as in CPR life support before mouth-to-mouth resuscitation. The tongue is in the throat in part because the jaws are too small. Tooth prints on the sides of the tongue is associated with lower sleep efficiency and lower blood oxygen during sleep (1). That explains morning fatigue and headache. Case of lifelong jaw-neck pain with worn and chipped front teeth from grinding in sleep. Note the narrow jaws. Teeth grinding is not just a dental event, but a reflexive response to the larger issue of oxygen deficit during sleep. Left untreated, the heart, brain and whole body is affected by sleep breathing disorder that manifest as teeth grinding. Traditional “night guard” for teeth grinding does little to help treat sleep breathing disorder. Deeper sleep stops teeth grinding (3), which points to making room for the tongue in the mouth as a new solution. 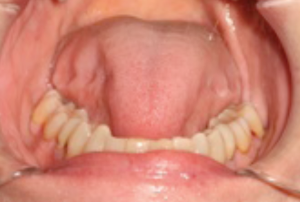 Same grinding case with enlarged tongue with tooth prints on its sides indicating sleep breathing disorder. New oral appliances are designed to improve sleep apnea by redeveloping jaws that are too small for the teeth and the tongue (4), (5). Other strategies includes ensuring full nasal breathing, reducing tongue swelling with diet, exercise, acupuncture, and weight loss. For a Whole Health approach to treat teeth grinding contact us.